How are you guys doing with this little gap in between Bikini Body Mommy and the re-release of 2.0 on September 8th? For me it has been busy as ever since the challenge wrapped up. 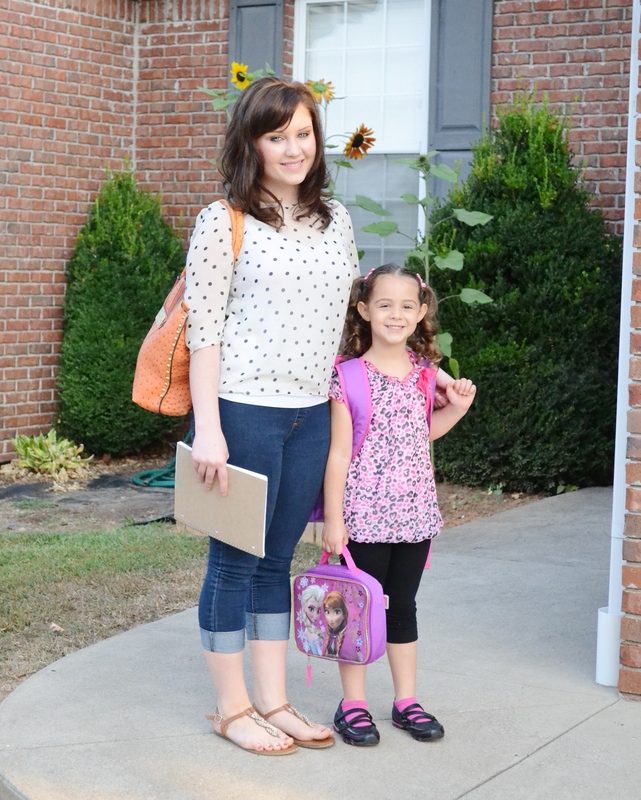 My baby girl started Kindergarten and my sister is also in school, she is enrolled in high school here in Western KY. The last week has been a whirlwind of last minute appointments and paper work and orientations and all the things that go along with kids being in school. However, this is all brand new for me, the first year I’ve been a mom with school age children, and since I was homeschooled after 2nd grade, I find the whole thing even more of a challenge to grasp and get the hang of. But here we are, on day 3, and everything is beginning to be more routine and the girls are doing great so far, I’m proud of them! As for the workouts, I have made a point to plan them carefully into our day. Until the new challenge starts we are picking random days from 2.0 and doing one as soon as I pick the girls up in the afternoon. It gives them a little break mentally before we dive into evening home work and adds a little energy boost to the roughest part of the afternoon. I’m still trying to get my run in after I drop the girls off in the morning, but to be honest, little man has kept me busy without his Sissy to play with and I have a deadline on chores and house work since the evenings are dedicated to home work, making dinner, and timely bedtime. Thankfully my nutrition is better. Since it’s just me and little man, and I’m busier in the morning, I have been eating smaller portions of either left overs, fresh fruit, or salad since those are quick and easy to grab. Rehydrate cranberries by placing them in a pan with just enough water to barely cover them. Bring to a simmer and cook for about 5 minutes or until the cranberries are plump and most of the water is absorbed. Drain any excess liquid. Set aside to cool for 10 minutes. Place cranberries and walnuts in a food processor and process for about 3 minutes. Scrape down the sides and add the yogurt. Process for another 2 minutes till everything is well blended. Chill for at least 30 minutes before using. Store in the refrigerator. 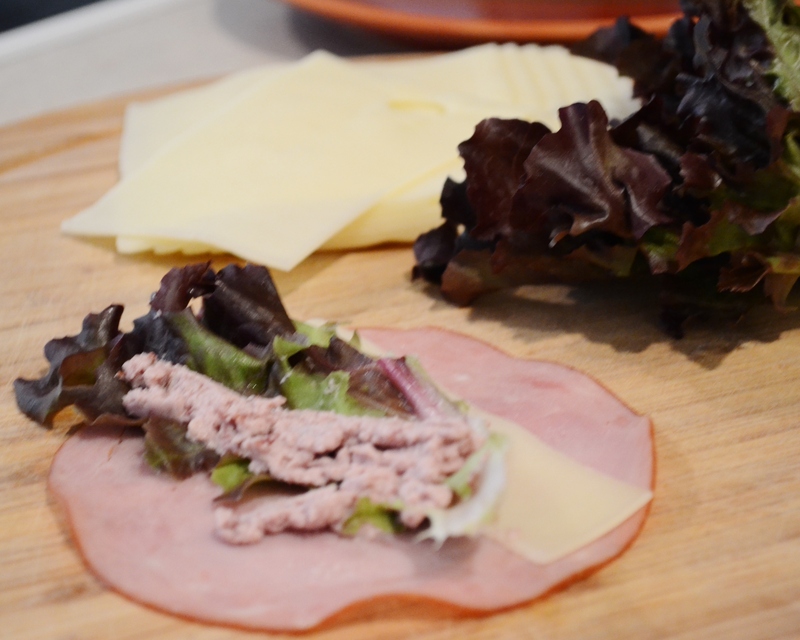 Lay down a slice of ham, spread with about half a teaspoon of cranberry walnut spread, layer on the cheese and the lettuce and roll up the ham. Setting it down on it’s seam will help it stay rolled. Repeat with the rest of the ingredients. NOTES: I made these for the first day of school and the kids loved them. They are a great alternative to a sandwich. 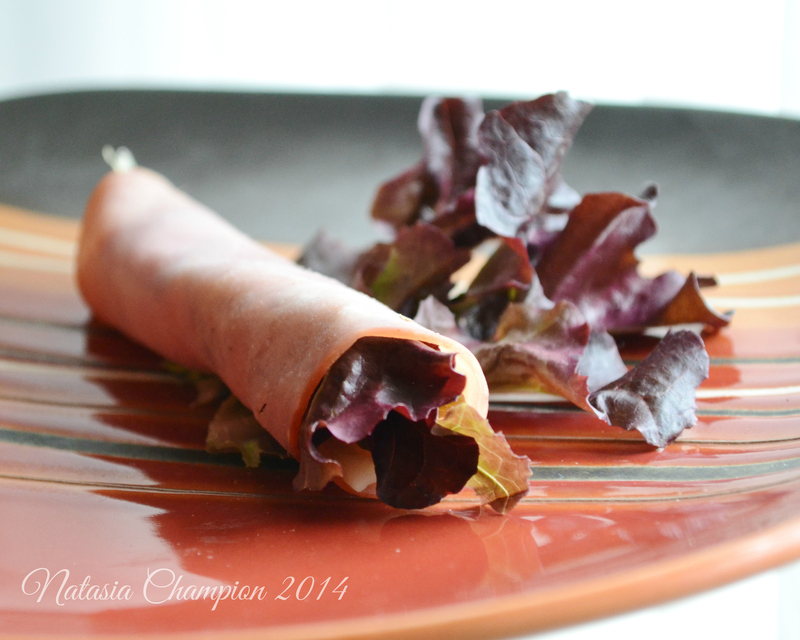 You can really use any kind of meat or cheese, and even have fun with these. Rolling up some thinly sliced granny smith apple in addition to or in place of the lettuce adds crunch and variety, or cucumber slices, or julienned carrot, you name it. So many variations are possible here. Today I sent 4 of these rolls, a small container of bite sized watermelon, a yogurt, and a little baggy of chocolate, cranberry, mixed nut trail mix. Who says school lunch has to be boring chips and a sandwich? This time has flown by! Let me first say how monumentally proud I am of myself for sticking to this challenge and not only NOT missing very many days, but doubling up on most of them too. I missed a workout the other day and did the killer death march day AND the HIIT back to back the next day, one workout after the other. I died immediately following, but I got it done. Little triumphs like that, this challenge has been full of them and I am incredibly proud. I stepped on the scale this morning and was not surprised to see a total weight gain over the 90 days of 3 lbs. My weight is down from day 75, but I have fluctuated this entire challenge between 209 and 212 for the most part. I think it’s pretty safe to say I lost no weight. However….. are you ready for this? I have lost a grand total of 20.5 inches!! That is fantastic!! But oh, so much more! I feel strong, I feel healthy, my skin looks incredible, my fine lines are disappearing more each week, my cellulite has decreased dramatically, my lower back (which has troubled me for most of my adult life) is stronger and almost never hurts, I’m more limber, I have so much more energy and motivation, and I could go on and on. I have gained so much more than just a slimmer body. I definitely have a good ways to go still. I am definitely on board for the next challenge, both the re-release of 2.0 and 3.0 in January. I have goals to meet and I’m excited! I can’t wait to see how much more progress I will make. 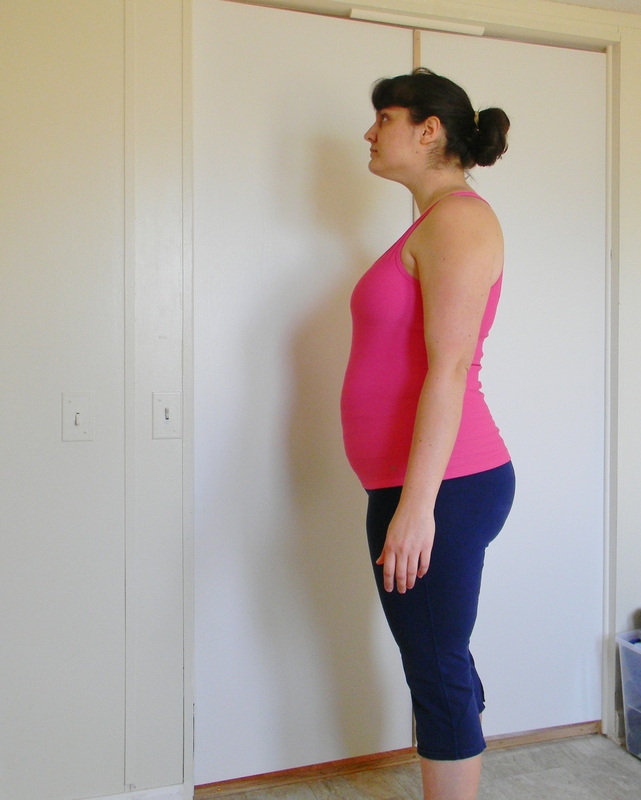 And now, with that in mind, that I still have a long way to go, I am sharing my progress pictures, days 1 and 90. It is all about the journey, it has ceased to be about the results. The results are happening, little by little, but this journey is amazing. Keep going mommies! Did you get off track? Fall off the wagon? You can just get back on! Did you finish but not as strongly as you believe you can? Here’s your chance to beat your old records, to do even better. I am going to keep going. I believe I CAN reach my goals. I believe I WILL! I am going to look back a year from now and see amazing changes. I already see them.